I’m back, folks! Sorry I went missing for a couple of weeks. My sweet grandma passed away and I wanted to spend as much time with her before she left and then I spent a lot of time with my family as they all came into town for the funeral. Thus, that left little time for creating new recipes and blogging. That being said, it’s been an emotional and cherished past couple of week. I love my grandma and I will miss her, but I know I’ll get to see her again some day. I also love my family and enjoyed spending extra time with them. It felt like a huge unplanned family reunion. Now I’m back to cooking and such and this is a fabulous dinner option! We grow bell peppers in our garden every year, but I think this year we turned out the best harvest yet! The peppers grew fast, got big, and the flavor has been super intense. They are delicious! We finally got our first overnight freeze/frost of the year so Beau went and picked all the peppers before bed. 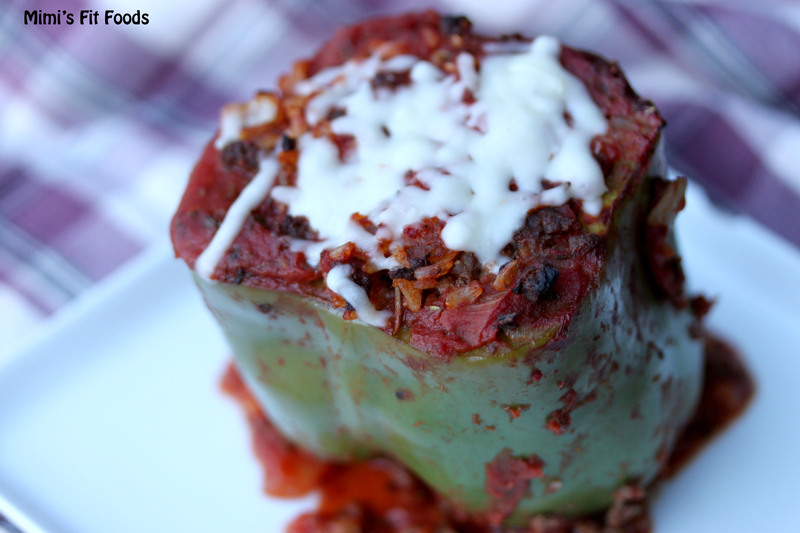 I figured that making stuffed peppers would be an awesome way to use some of them up. Awesome, indeed! These are super simple. The only thing you have to remember is that the recipe calls for cooked brown rice. So, if you haven’t made that in advance then your prep time will increase by 45-60 minutes. I baked my rice earlier in the day (since baking it only requires about 1 minute worth of effort, but the rice turns out fluffy and fabulous). Then you just simply cook your ground beef, mixed with onion and garlic, in a skillet until browned. Mix in the cooked rice, tomato sauce and Worcestershire (this stuff somehow elevates the flavor of ground beef like crazy), and stuff your peppers, bake the peppers, and then eat them! Easy peasy! The flavors of bell pepper, ground beef, and tomato just marry so well together. We found these to be very filling. I made a green salad to go with them because I was leery of how filling these would be. The green salad was tasty, but it wasn’t necessary to “fill us up” like I thought it would be. Give these a try. Bell peppers are easy to find year-round and I found the dish to be fresh, but also comforting. Who doesn’t want a comforting dish around this time of year?? Heat a skillet over medium heat. Add beef, onion, and garlic. Season with salt and pepper. Cook and stir beef mixture until meat is evenly browned and onion is softened, about 5-7 minutes. Mix the browned beef, cooked rice, Worcertershire sauce, and 1 can tomato sauce (I did this right in the skillet). Add salt and pepper if needed. Spoon an equal amount of the mixture into each hollowed pepper. Mix the remaining can of tomato sauce with the Italian seasoning in a small bowl (or right in the can if you’re careful not to spill everywhere) and pour over the stuffed peppers. Bake in the preheated oven, basting with the sauce every 15-20 minutes, until the peppers are tender, about 1 hour. Sprinkle the peppers with grated mozzarella cheese after baking.